You can probably name several different countries that your recent ancestors originated from, but are you familiar with your family’s health history? Knowing the health and medical history of your relatives can identify patterns of diseases and illnesses that you might not have even been aware of. When you’re aware of the health of your family members, you can better prepare for any health risks that run in your family. You might think you know your history by knowing your parents or sibling’s medical history. However, knowing the health history of more than just your immediate family is essential to being fully prepared for potential health risks. Let’s discuss why it’s so important to know your family’s health history. Knowing your family history–and sharing it with your doctor–can allow you to take personal steps to reduce any health risks. Families share a few common factors–genes, environment and lifestyle. Let’s start with genes. Genes are shared within a family over generations of family members. As we know, all DNA is different from one person to another. However, genes that carry things like breast cancer or celiac disease can be easily passed from one generation to the next. For example, if someone in your family–say an aunt or a great grandfather–has celiac disease, you could be more likely to possess that same gene than someone who doesn’t have any history of that disease in their family. A disease or health condition that runs in your family is considered to ‘run in the family’ only if more than two family members have or had it. For example, if your uncle (and only your uncle) has high cholesterol, odds are high cholesterol is something of an isolated case with your uncle–rather than something that runs in your family line. Something to remember when digging through the history of your family members’ health is to know that just because someone in your family has an illness or disease, doesn’t mean you will definitely have it too. Genes are funny in the way that they pick and choose where they go. Better still, being aware of any health patterns that run in your family is an excellent precautionary step as it can help you catch things early on. Tracking the health history of your entire family line is no simple task. Instead of tracking the entire health history of your family, start by collecting data on just a few generations. Doctors suggest that a “complete” health record dates back about three generations. This means siblings, parents, aunts, uncles and grandparents should be enough of your history to give you good insight on your own health. So how should you go about collecting this family health history? Start by drawing out a family tree. This will give you a good visual of who and what you’re looking for. Then, start with what you know. Odds are, if your father has high cholesterol, you’re already aware of it. So mark down any health concerns that you already know about and go from there. Next, mark down the age of family members that have passed. What was there cause of death? Did they die at a young age? Or later on in life? Collecting this information can help fill in the gaps when it comes to your personal health. First, write all of the information you know down on paper. Then, you can start inquiring about additional health information from your family members. Ask them about any health conditions or chronic diseases that they know of within your family line. Be sure to ask family members about any mental illnesses or intellectual disabilities as well. The more health history you know, the better. 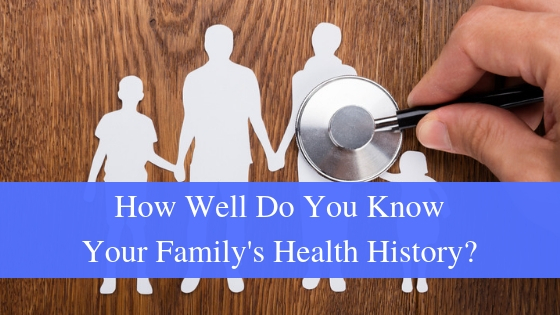 Once you’ve gathered all of the family health history you can find, be sure to share the results with your health professional. With both you and your doctor aware of all your potential health risks, you can start preparing earlier. And remember, finding out the health history of your family doesn’t have to be so daunting! Finding out what runs (or doesn’t run) in your family is a great way to be proactive when it comes to your health. By Urology Specialists|2019-03-25T13:19:48+00:00November 22nd, 2018|Categories: Urology Specialists|Comments Off on How Well Do You Know Your Family’s Health History?